B-17G on display at the Grissom Air Museum just outside of the former Grissom Air Force Base in central Indiana. Grissom is named after famous astronaut Virgil I. Gus Grissom, commander of the crew that perished in the Apollo I fire. Miss Liberty Belle missed WWII action, but had a long career as a nuclear test aircraft, drone, and as a radio controlled test aircraft. The original Miss Liberty Belle, B-17G serial number 42-31255, flew 64 complete missions out of Cheveston, England, but was lost near the end of her 65th mission on August 3, 1944. 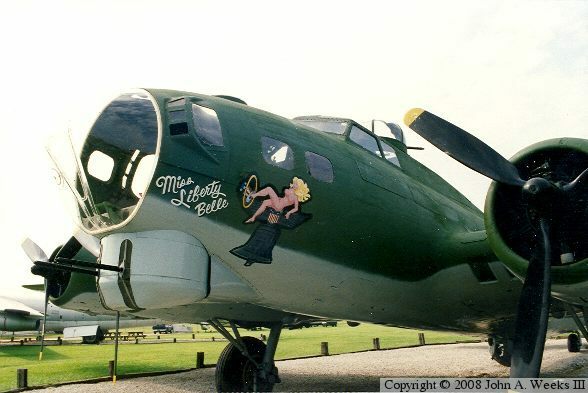 44-83690 is painted in the colors and markings of Miss Liberty Belle to honor this crew and all who flew for the 305th Bomb Group. Thanks go to Ian White from the 305th Bomb Group Memorial Association for filling in the details on the original Miss Liberty Belle.